I am trying to connect an Microsoft SQL Server 2012 database to an Xamarin.Android app. Warnung: Es wurde kein Code generiert. Wenn Sie versucht haben, einen Client zu generieren, könnte die Ursache hierfür sein, dass die Metadatendokumente keine gültigen Verträge oder Dienste enthielten oder dass erkannt wurde, dass sich alle Verträge/Dienste in /reference-Assemblys befinden. Stellen Sie sicher, dass alle Metadatendokumente an das Tool übergeben wurden. Warnung: Wenn Datenverträge aus Schemas generiert werden sollen, müssen Sie sicherstellen, dass die Option /dataContractOnly verwendet wird. Warning: No code has been generated. If you tried to generate a client, a possible reason for this could be, that the meta data documents do not contain valid contracts or services or that all contracts/services are lying in /reference-Assemblys. Please make sure, that all meta data documents are transfered to the tool. Warning: If data contracts are generated from a schema, you have to make sure, that the option /dataContractOnly is used. What is the problem? 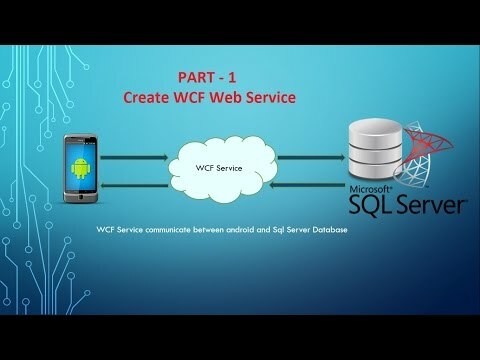 Can anyone maybe help me integrating Web Api or WCF Service so I can read data from external database and display them on my android app? Hi, Please follow these tutorials. Developing RESTful API in ASP.Net With Azure Database. I do not want to create a new database (particularly to use Azure database as expected, a payment is required, or at least by signing up one has to give credit card data which I don't have). I have an existing database given by my employer which runs on Microsoft SQL Server 2012 and need to connect / read from this. Thank you for your answer, your code and your showing. What do you mean with this sentence: "in your Portable you need an Interface like this"? What portable? In which folder does this interface have to be? Outside the Android project? oh sorry, that's for Xamarin Forms, but here we are in Android... I will give it a try on Android only and let you know, ok ?